nosher.net - Mattel advert: "With Aquarius you won't get left behind"
"With Aquarius you won't get left behind"
Very much an also-ran in the home/personal computer race, comes this advert for a Mattel Aquarius - a Z80-based unit with a chiclet keyboard built for Mattel by Far East-based Radofin Electronics. Mattel was a games company and was hoping to break in to the computer market in the same way that other games companies - in particular Atari - had. However, this machine failed to sell - its graphics were no match for even the VIC-20 and it was in fact a poorer performer than the Intellivision consoles Mattel had been making for years. It retailed for $160 or £99 in the UK (about £330 in 2019 terms) but was down to £80 (£260) by September of 1983. It only sold for four months before being discontinued due to poor sales, perhaps in part because the 16K RAM pack needed to overcome the machine's installed 4K was nearly as expensive as the Aquarius itself, originally selling at £49.95, until this was dropped, along with the price of the main machine, down to £29.95 (£100 in 2019). Nevertheless, despite the poor sales, it did briefly flirt with the top 20 in the UK hardware sales charts during August 1983, reaching number 19. In the same week (August 25th), Sinclair held the number 1 and number 5 spots with the Spectrum and ZX81 respectively whilst Commodore had 4 and 8 - perhaps surprisingly the VIC-20 was ahead of the C64 at the time. Despite its short life, one particularly interesting add-on was announced for the Aquarius, when Mattel revealed details of its Home Control System in August 1983. This allowed up to 256 mains-operated devices, like lights and central heating (and no doubt electrically-powered curtains - the automation of which had apparently been Holy Grail of computers since the late 1970s), to be controlled remotely by plug-in units programmed by the Aquarius. The system had been developed by turntable manufacturer BSR and Pifco in Scotland. The improbably-named Mike Lunch, © Popular Computing Weekly, 6th October 1983A few months later Mattel announced a $156.1 million loss for the quarter to July 1983, which it followed up by sharply reducing marketing of the machine in the US, a move which meant that the Aquarius would no longer achieve full nationwide distribution. This effectively meant that Mattel abandoned the Aquarius at the end of 1983, which also cast doubt upon the machine's future in the UK. Mattel UK's managing director, the improbably-named Mike Lunch, tried to dispel these fears by suggesting that "[any] worry is misplaced", before explaining how the company had sold on its rights to the Aquarius in non-English-speaking countries to the Aquarius's manufacturer Radofin. Radofin had quickly stepped in and swiftly announced two new machines - the Aquarius 2, due in January 1984, and the Aquarius 3 due in April, with 64K to take on Commodore's 64. Prices weren't announced at the time, as Radofin's managing director Alan Leboff said - "I could guess, but there are too many hazards in doing so at this stage. Who knows what will happen between now and the New Year?". However, the price of the original Aquarius was known at the time, as Radofin had dropped it to £59.95 after taking the ailing machine over. Leboff said of the price move that "The deal we have done with Mattel means that they will bring the price down to this level and then, at some point, we will take over supplying dealers directly, rather than as at present where we supply Mattel, who in turn supply the retailers". He continued "We hope that the price drop will have a dramatic effect on sales". Radofin was hoping that it would become the sole distributor by Christmas of 1983, and was planning a raft of price cuts to boost sales, including games cartridges down to £12.95 and the dedicated data recorder down to £39.95. It was also planning more cassette software and a light pen. Shortly before this happened, Mattel UK's managing director Mike Lunch announced he was leaving the company. Ian Wilson, Mattel UK's financial director who was acting as the company's MD (before getting the gig full-time in November) said "The fact that our own parent company is having some problems is well known and to say that they do not affect its subsidiaries would obviously not be true. But there is no absolute relation betweem those problems and the departure of Mike Lunch". However it was also revealed that Mattel had already seriously considered shutting down up its computer division because of the mounting losses, and there was also speculation that Mattel might dump some of its toy division shares in order to raise money to plug the gap. It seemed that selling of the computer division was put on ice as it may have damaged any sell-off of the toy division, which at the time was enjoying a record year on the back of the Cabbage Patch craze. The Aquarius even managed to muster up a national user group, set up by John Jones of West London and which was anticipating a membership of 4,000. He said of the launch "We're trying to get people together to start regional user groups and workshops and hope to have our own microfair for Aquarius products at the end of the year. People don't know where to get software or who to go to to solve their problems - that will be one of our functions". All of which, of course, makes Mattel's tag-line of "You won't get left behind" somewhat ironic. Indeed, by 1984's British Toy and Hobby Fair, held in January, Mattel, which had been facing massive losses of $156 million in the first quarter of 1983 alone - which was better than the loss recorded just by the computer and video game division of $166.7 million - was no longer showing either the Aquarius or the Intellivision. The company was exposed as it was neither a designer nor a manufacturer of computers and seemed to have been squeezed out of the voraciously-competitive market of the time. It had gone through two managing directors since the Aquarius had launched and had abandoned the electronics field entirely, retreating in to its core "toy" market, launching, of all things, "Green Goddess" Barbie dolls. Diana Moran, who hosted a fitness segment on the BBC's breakfast TV program in the mid-1980s, became known as the Green Goddess on account of her green leotard. Mattel was not alone in disappearing, as it seems to have been a time of clear-out for companies otherwise known for toy electronics - also missing was Texas Instruments, famous for Speak 'n' Spell and whose TI 99/2 never really launched, as well as the TI 99/4A which was killed when TI announced it was pulling out of the home micro market. The "game" survivors were Atari, which had just launched the 600XL, and Coleco with its Adam, although that wouldn't be for long. It was not all bad for toy companies: Palitoy UK was working on the first non-Sinclair cartridges for the Spectrum - a "Death Star" battle game, based upon Return of the Jedi. 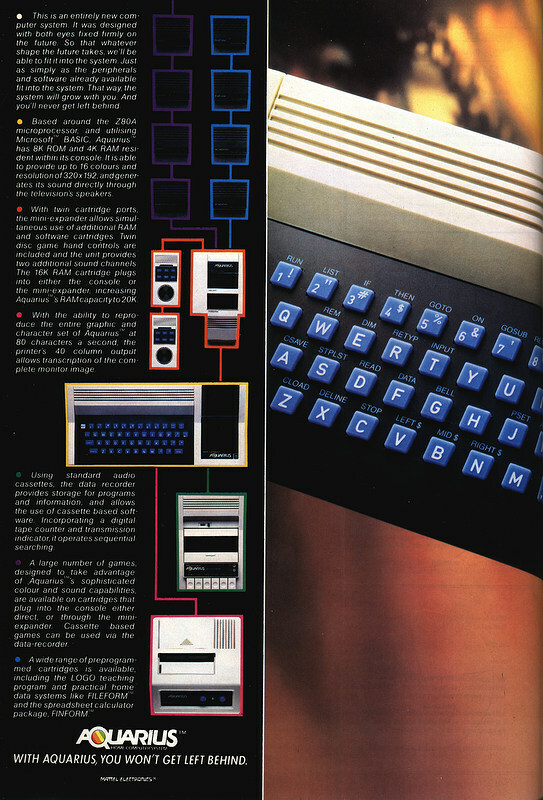 Cartridges had become a viable option for the Spectrum with the release of the Interface 2. Mattel briefly flirted with the distribution of games software electronically, as part of a wave of "alternative distribution systems" that was in vogue at the time and which encompassed everything from floppy 7" 45rpm vinyl records, broadcasts on AM and FM radio - National Public Radio (NPR) in the US had recently secured permission from the FCC to broadcast software on an unusued part of the FM band - and TV using the teletext system, as well as the more obvious dial-up systems like CompuServe and bulletin boards. In the summer of 1983, it formed PlayCable as a joint venture with General Instrument Corp. and was sending videogame software over cable TV to subscribers in three US cities. 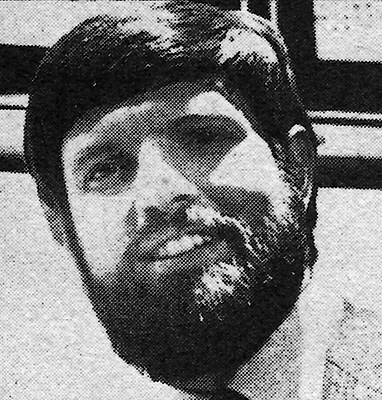 Also in the summer of 1983, Thorn-EMI - one of the UK's largest entertainment groups - anounced its own cable software plans with a dedicated software channel featuring a rolling selection of top-20 computer games and education packages. At the time, the company already had a single cable franchise in Swindon and was said to be looking for another in Leicester and had already demonstrated an experimental cable software system, using an Atari computer, at the Cable '83 show earlier in the year. Thorn-EMI's Peter Chandler said of the plan that "It is an obvious development for us - we have interests in cable, film and music and we also have a computer software division". Thorn was apparently waiting for faster "second-generation" teletext decoding chips in order to make the system fast enough to be viable. These chips seemed to appear the following year when Thorn-EMI announced more details of its Teletext-based scheme which was expected to use a "full-field format" in order to provide up to 100,000 pages of information in the same sort of time as 100 pages of conventional television-based Teletext, or at a rate of about 5,000 pages per second. Full field teletext used the entire frame of broadcast, rather than being squeezed in to the vertical blanking interval as normal Teletext was, but could only be offered over cable as there were no free television channels available in the UK. Thorn-EMI had been hoping to use the recently-obsoleted VHF frequencies made available when 405-line broadcasts ceased, but these had all been given over to cellular radio. Also in 1984, but predating Thorn-EMI's announcement by a few months, national newsagent chain W.H. Smith announced its moves in to cable services, when it announced a cable network specifically for games on the back of the eleven new cable franchises being launched in the UK early in 1985. Francis Baron of Smiths, in predicting a future where games wouldn't be bought physically but would be downloaded, said "The computing technology for the system has been available for a while, but the existing cable networks proved unsuitable. Most of the existing systems use the HF standard, but for the kind of things we have in mind we use a VHS/VHF delivery system. In addition, most of the old systems only have four channel capacity - obviously they're all going to be used up". He continued "Software is the be-all and end-all of our service - it's being proved more and more that it's the quality of the software that really matters". Smiths already had a licence with most of the big software houses in the US, but as yet no British software companies had been signed. Baron continued "it might be a good way for software houses in this country to test out the market for their games worldwide". The network, called, perhaps predictably, The Games Network, was expected to cost about £10 per month and provided some twenty games at a time, all downloadable in less than ten seconds on to a 6502-based console called The Window. WH Smith's longer plan appeared to be to become a major force in interactive cable services, and games was seen as an easy way in. As Smith's technical manager David Gayler suggested "People buy home computers with all sorts of pious intentions about word processors and education, but the evidence suggests that an astounding proportion simply end up playing games on them". The competition amongst High Street newsagents seemed fierce, as WH Smith's competitor John Menzies announced its interest in an online software system set up by distributors Program Express of Edinburgh and Micro Dealer UK. The system was similar to the Romox system which had been trialled in the US and to which modem-maker and erstwhile Sinclair distributor Prism had the UK rights for and involved "retail modules" installed in individual shops connected to a central host computer from which customers could download software of their choice to either cassette, floppy disc or even cartridge. Robert Black of Menzies reported that the newsagent had ordered five of the terminal machines which meant "we will be able to have a full range of software available to customers all the time, and we will save a huge amount of storage space. We hope to have our first machine installed before Christmas". Perhaps Mattel's problems stemmed from a fundamental lack of direction. Back in 1980 at the third annual Rosen Research Personal Computer Forum, held in New Orleans with participants including Chuck Peddle of MOS/Commodore, Bill Gates of Microsoft, John Roach of Radio Shack/Tandy and Steve Jobs of Apple, Mattel's Jeff Rochlis had made the observation that "in order to appeal to the mass consumer, a home computer had to provide a clearly perceivable value that was unique and not a duplication of some other service, and it had to do this for under $500". When questioned as to what exactly this unique selling point might be, he replied with the usual nebulous suggestions of "education, personal finances and communications". Personal Computer World suggested that because Mattel had already spent $10 million on developing their Intellivision system, they should surely know that there was a market somewhere, but that they didn't seem quite sure as to where that market actually was. There was clearly some loyalty behind the system as as late as the spring of 1985 the official owners' club - Aquarius User - was offering a discount on what may have been the entire software catalogue available for the machine: 22 games for £3.50 each.